WADA Kohaku （1945-） Japanese-style painter. Born in Osaka Prefecture. Currently resides in Tokyo. Born Wada Reiko. Graduated from Soai Senior High School. 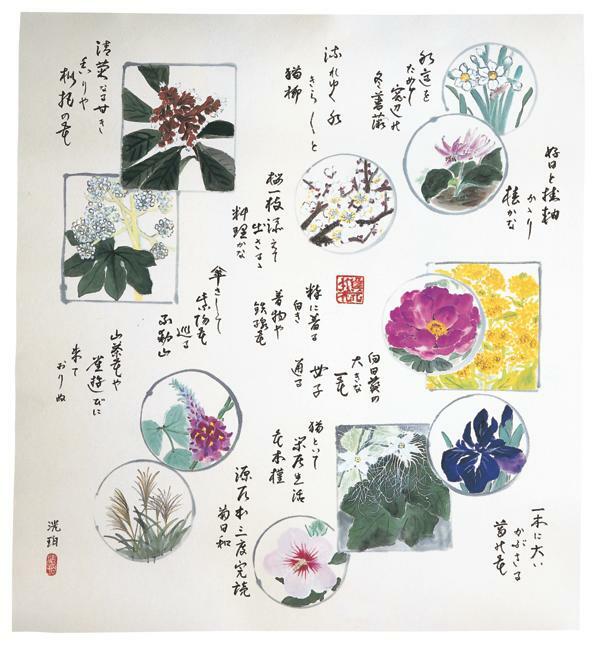 Studied sumi ink painting under Jikihara Gyokusei and Katagiri Hakuto, and studied calligraphy under Nakagawa Yuko. When she resided in Osaka she belonged to the haiku journal “Soshun.” In 1964 she received a research association award at Osaka Shiritsu Nihongaten. In 1972 she received the Moriguchi City municipal assembly president’s award two times. In 1975 she received the Nihon Bunjin Gafu award. From 1977 to 1985, she received a special award at Nihon Nangainten (twice), a chairperson’s award at Nihon Nangainten, a Nihon Nangain award, and a Nihon Nagain 25th anniversary award, etc. She has also received many other awards both in Japan and other countries and continues to be active on the international stage. State Tretyakov Gallery award, Art Union Netherlands award, Mayor of Berlin award, Hungary-Japan art concert and culture grand prize, Turkey Minister of Culture award, Carrousel du Louvre exhibition Prix de Lions, Prix Tricolore de La Paix de l'Art, Monaco Cote d'Azur international art award, Prix d’or award, Chevorovski Palace recommendation art grand prize. Her works are in collections in places such as the Principality of Monaco, the Consulate General of Japan in New York, and Jiangsu Provincial Art Museum. Wrote four documents for a course on sumi ink painting techniques. Has held five personal exhibitions. Leader of Furyusha and former coterie of Nihon Nangain. Hanagoyomi. Created in 2012. Art World. Received a world cultural contribute top artist grand prize.